Designed for cool-to-the-touch comfort during the night. A top layer foam with our advanced cool-to-the-touch Chill™ Cooling Technology. Gel memory foam designed to respond to your body’s unique shape for more comfortable sleep. Durable support for sitting and extends the sleeping surface. Which Conform Collection is Right for You? Each collection uses a combination of foams to deliver custom, full-body support and comfort. A combination of memory foams work together to deliver conforming, all-over support that's tailored to you. Our covers are designed with premium-quality fabrics, with some featuring special climate treatments for cooling comfort. Super-stretchable, mid-loft knit fabric with the addition of MoistureProtect™, designed to draw moisture away from your body during the night. Super-stretchable, mid-loft knit fabric cover with Chill™, Cooling Technology for cool-to-the-touch comfort during the night. We use high quality, durable foams to create a top layer that responds and conforms to your body's unique shape. The latest innovation in gel memory foam, designed to respond to your body's unique shape for a more comfortable night's sleep. Conforming gel memory foam with our advanced cool-to-the-touch Chill™ Cooling Technology. Our base layer is made of high-quality foam to help deliver the cushioning support you need. High quality firmer supportive foam with gel added for additional flexible, durable support. Around the side, our Edge System gives you a better seating edge when you get out of bed. Want to skip the store? 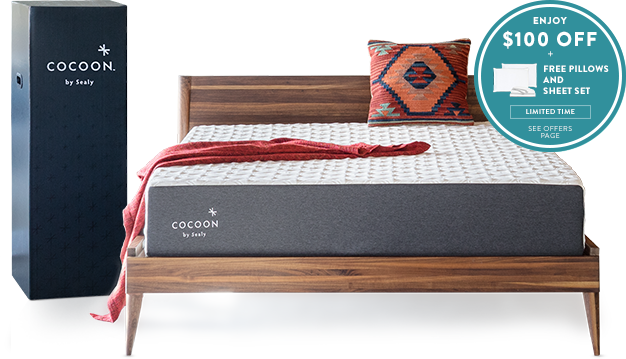 Cocoon™ by Sealy is a premium memory foam mattress that's shipped in a box, right to your door.